In our previous blog on multi-factor merits, we discussed the diversification benefits of combining equity factors. 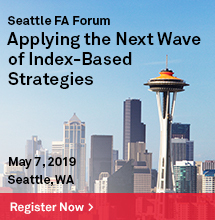 We highlighted how multi-factor indices may generate more stable excess returns, while avoiding the risks inherent in timing factors. But to achieve this, can market participants just throw lots of factors into a pot and hope for the best? Or should a little more care be taken in selecting a blend of ingredients? The secret ingredients in S&P DJI’s latest multi-factor index are no secret at all; the S&P 500® Quality, Value & Momentum Multi-Factor Index uses just three key factors—and they are printed right on the label. Determining whether this combination of factors (or any other) is sensible and likely to be effective requires following a simple checklist. 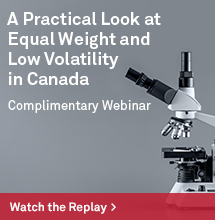 Do each of the factors demonstrate a widely accepted, long-term risk premium or pricing anomaly? Do the active returns between factors exhibit negative or low correlations? Is there an economic rationale to explain why the combination has been chosen? Has the interaction between factors been considered and does the outcome generate the desired balance between factor returns? In the case of quality, value, and momentum, not only are their risk premiums widely documented and accepted in academic research, but the correlations between their active returns are often low or negative. To understand the economic rationale for this multi-factor combination, it may be helpful to think of the aggregate portfolio in terms of a single synthetic target stock. This synthetic stock has the attributes of quality, value, and momentum simultaneously. Inexpensive stocks are generally desirable, providing they do not represent value traps. Requiring that the stock has momentum suggests that the market has become increasingly optimistic about the company’s prospects. Therefore, the stock can possibly be picked up while it is still at a relatively low multiple. 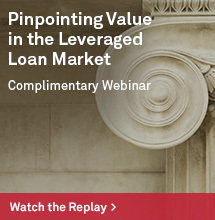 Focusing the search on high-quality companies can further reduce the value trap risk. High return on equity, a low accrual ratio, and a strong balance sheet with low leverage all indicate a company with an adequate margin of safety that is capable of meeting challenges in the market. To complete the final step on our checklist, we shall look at the sources of the returns of the S&P 500 Quality, Value & Momentum Multi-Factor Index. To do this, we have calculated the regression coefficients of the historical returns of the index against the active returns of several single-factors. Orthogonal returns were generated for each factor by stripping out any correlations between their active return series. This leaves us with entirely independent, systematic factor returns that explain the vast majority of the performance of our multi-factor index. It is evident from Exhibit 1 that the multi-factor index demonstrates reasonably balanced exposure across the returns of the desired factors, in addition to significant market beta. This balanced output is in part due to the equal-weighted approach used in creating each stock’s multi-factor score. It is also an indication that the interactions between the various factor scores are not causing any particular factor to become overly dominant. 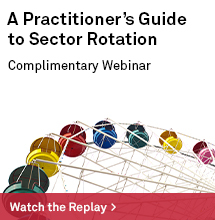 Changing or increasing the number of factors used in the selection process may have an unexpected impact on this balanced exposure. 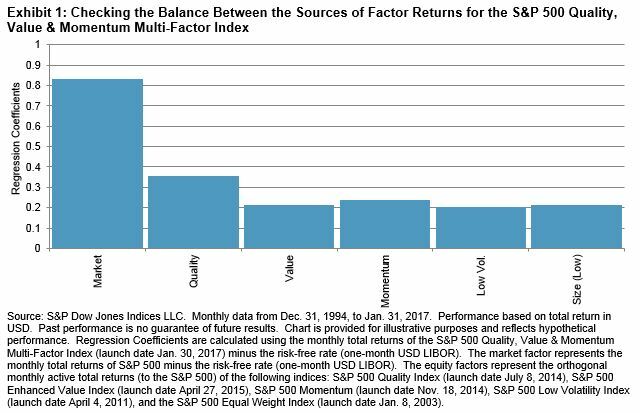 Interestingly, but not surprisingly, the multi-factor index benefits from additional exposure to the low volatility and size factor returns. Since the momentum scores used are risk adjusted, the low volatility factor gets in through the back door. As for the index’s smaller-cap bias, the final weights are generally tilted away from the market-cap-weighted benchmark because the weighting method incorporates the multi-factor scores. So although the recipe for the S&P 500 Quality, Value & Momentum Multi-Factor Index targets just three factors, it is evident the final returns benefit from a generous handful of the low volatility and size factors for good measure.